I've found that using ground tea is a great (and easy!) way to add lots of unique flavor to a variety of things, like a caramel chai tea latte or slow cooker steel cut oats. I like Blue Lotus brand because it's a fine powder. If the chai you use is more of a loose-leaf tea, just whirl it around in a coffee grinder or grind it with a mortar and pestle until its more the consistency of ground spices. After that, just put it all in a big slow cooker and watch the magic happen. Mr. Ninj's favorite way to eat this slow cooker chai apple butter is swirled into cottage cheese: I was skeptical at first, but now I'm a convert. 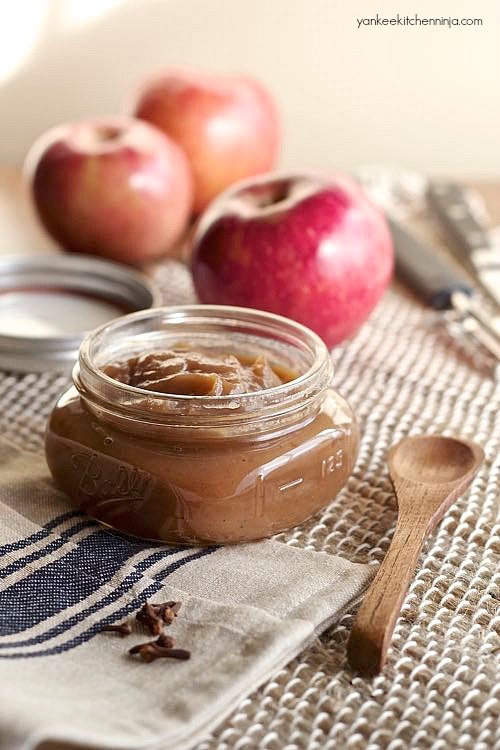 Have you ever eaten apple butter the Mr. Ninj way? Leave a comment: The Ninj wants to know. Note: If you don't want a ton of apple butter, remove half at the applesauce stage, add only half the brown sugar and cook the rest down into apple butter. Two for the price of one! Toss the apples and chai tea together in the crock of a large slow cooker. Cover and cook on LOW, stirring occasionally if you happen to be around, for about 6 hours (at this point, it will be applesauce). 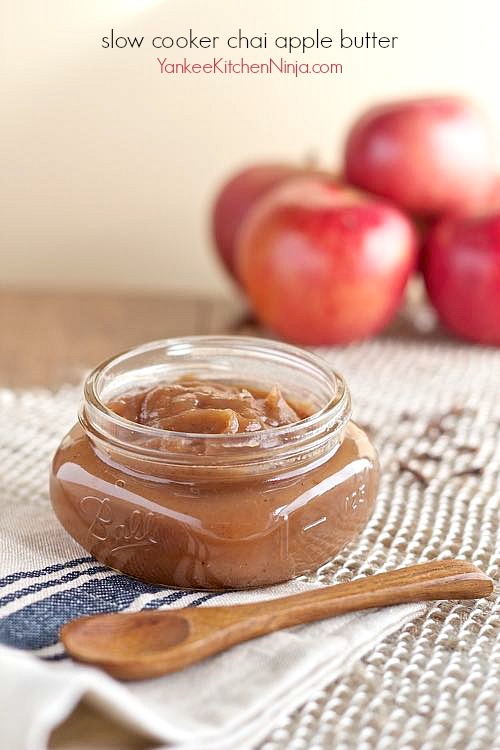 Puree with an immersion blender, stir in the brown sugar, then replace the lid, leaving it slightly ajar, and continue to cook for about another 2 hours or until the apple butter has reached your favorite, thick consistency. I am making this tonight. This has really got me going for some reason! You won't regret it, Emma -- it's like a crisp fall night in front of a campfire. But sweet and edible in a way that campfires are not. :-) ENJOY! Love Chai Tea. They have a couple blends at Teavana that are fantastic! I made this yesterday & it was delicious! I would like to know how to make it a little thicker though. 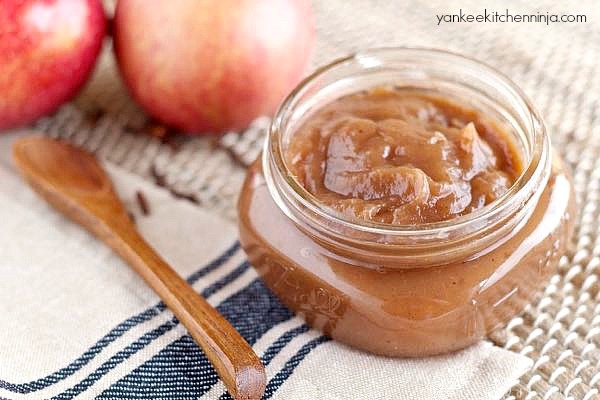 It's pretty loose, more like an applesauce than a spread. Would more than 2 hours with the lid ajar have helped? I like to spread this on pancakes, with skyr & fresh fruit. I did that today and the flavor is SO good. Thanks! Karen, cook it longer if you like (I noted that in the directions) -- everyone's slow cooker can cook a little differently. I'm so glad you liked it!! !